Bad boys turned GREAT! Definitely a gift of Julie Lessman’s. “A romance born out of friendship is the most endearing type of love.” – From The Thornbearer by me. That’s what happens with Lizzie O’Connor and John Brady. One catch of a breath changes everything. 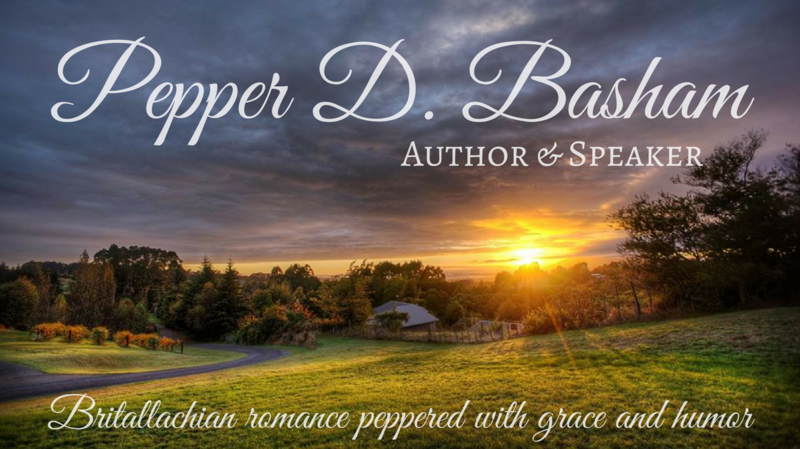 Add to that a little bit of infatuation on Lizzie’s part and a whole lot of self-denial on Brady’s part – and you get the makings of a beautiful story of God’s faithfulness and forgiveness – and one young woman’s determination. So….here’s my review of A Passion Denied from 2009. 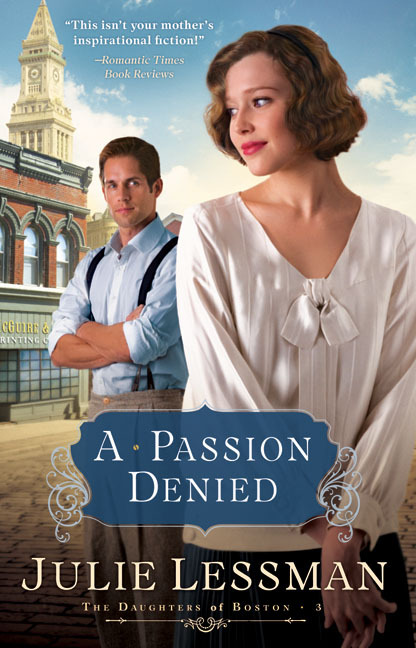 Julie Lessman breaks through the conventional mold of inspirational fiction once again with her newest novel, A Passion Denied, third book in the Daughters of Boston series. Chock full of intense emotional drama, sizzling romantic interludes, powerful spiritual insight, and a few chuckles along the way – A Passion Denied will leave you thinking about these characters long after you’ve closed the book. The emotions and the turmoil of the characters are palpable.What I admired most about the novel is Lessman’s consistent use of faith and Scripture throughout the book, instead of having it tagged on at the end. Our faith should be a continual pool of spiritual strength in our lives, in good times and difficult – transforming our worldview in every situation and moment. Julie Lessman does that. She portrays how faith is involved in every part of the characters’ lives and therefore guides their behaviors and actions. Now, being a romantic at heart, there were times when I wanted to stop reading the book because I didn’t know if my heart could take it anymore. The emotional ‘valleys’ in the book are intense, but thankfully, Julie put me out of my misery by the end so I didn’t have to mentally slap any of the characters. Sweet, innocent, Lizzie O’Connor has loved John Brady since her childhood. His faith, commitment, and personal integrity are everything she’s longed for in all of her ‘fairytale’ dreams. As Lizzie grows up and begins to see the world through a woman’s eyes, a future romance with her best friend seems highly unlikely. Despite their mutual growing affections, Brady will not give in to his love for Lizzie. Secrets from his past, wounds that seem irreversible, hold him back from making a commitment with his heart to anyone but God. When Lizzie learns the truth about Brady’s past, will her love remain constant or will another man draw her away from a love that is pure? Will Brady accept God’s complete forgiveness for his past so he is free to love in his future? I highly recommend this third and brilliant installment to The Daughters of Boston series and look forward to reading more of Julie Lessman’s work. DON’T FORGET – leave a comment about which character is your favorite from this novel and get your name in the drawing for one of Julie’s books -including her up-and-coming novel, A HEART REVEALED. I’d have to say John. Love a good strong man!! KC … IT’S GOOD TO HEAR JOHN IS A FAVORITE BECAUSE HE GETS SLIGHTED A LOT. I SEE HIM AS MY BILLY GRAHAM HERO WITH A PAST AS DARK AS JOHN IS GOOD, SO HE WAS FUN TO FLESH OUT. Oh my. I love love love both of these two. I think they are my two faves. For now. Until tomorrow. But I love Lizzie and I love Brady. And I love Julie and her twists and turns. This is one I still need to review. Same for AHU tomorrow. I love them Julie, I truly do, but I have this horrid procrastination problem… /sigh/ Need to just sit down and spend tomorrow reviewing, including these two! And I still love ya both – even though Pepper’s having a good time at the conference this weekend in the Blue Ridge Mountains without me ;). CAROL … NOBODY UNDERSTANDS MORE THAN ME WHEN IT COMES TO BEING BEHIND ON STUFF. I AM CRAZY NUTS RIGHT NOW TRYING TO WRAP UP MY LAST O’CONNOR NOVEL (TWO SCENES TO GO!! ), WHICH IS TWO MONTHS BEHIND. PLUS, MY FINAL GALLEYS FOR A HEART REVEALED CAME IN YESTERDAY TO PROOF BY 5/23. YIKES … NO TIME TO SLEEP!!! Well we’re back to one of my favorite O’Connors in this book. Lizzie and of course as I mentioned on Monday, Faith are my two favorites. Perhaps that would be why I had such a hard time like a few others did liking Charity after her “turnaround”. I can’t say I don’t like her at all but I never really identified with her or considered her a person I would want as a friend if she were real because there isn’t any common ground there. Faith tended to stay in the background of things and be picked on which in my case ended up driving me to be more solitary and turn to books for companionship. And there’s where Lizzie and I would get along very well, that love of books and piles of them always around with my nose in at least one. MELISSA … I AM SOOOO LOOKING FORWARD TO SEEING WHAT YOU THINK OF CHARITY AFTER A HEART REVEALED BECAUSE SHE IS A MAJOR CHARACTER IN IT DUE TO THE FACT THAT SHE IS EMMA’S BEST FRIEND AND OWNS THE STORY WHERE SEAN AND EMMA WORK. LET’S SEE IF I CAN WIN YOU OVER TO CHARITY’S SIDE. I HOPE SO, BECAUSE THE WOMAN CRACKS ME UP IN ALMOST EVERY SCENE SHE’S IN … EVEN THE SERIOUS ONES!! TALK ABOUT COMIC RELIEF!! John Brady is my favourite character. Well, now that Luke McGee has come along, he may have to share the spotlight! LOL. He’s such an honorable, good guy with a tortured past. Who could resist that? Loved that book!!! Thanks Pepper & Julie! SUE … I HAD NO IDEA BRADY WAS YOUR FAV AS WELL AS K.C.S!!! THAT MAKES ME GLAD BECAUSE LIKE I TOLD KC, BRADY GETS OVERLOOKED BECAUSE HE’S NOT A BAD BOY. BUT OH BOY, LUKE MCGEE — THE BEST OF BOTH BAD BOY AND JOHN BRADY!!! BE STILL MY HEART!! Amen! That’s all I’ve got to say about that! KAREN, YOU ARE GOING TO LOVE, LOVE, LOVE SEAN AND EMMA’S STORY, I HAVE NO DOUBT, GIRL!! CAN’T WAIT TO HEAR WHAT YOU THINK. Since I’m currently reading A Passion Denied I’d have to say Lizzie. I just love that girl. I tend to love the heroes, but close to the beginning of this book when Lizzie goes to the church and lays in the pew after Brady has been so infuriating, well, I just felt like I was right there with her. I just love Lizzie. Also, I am so jealous that Pepper is at Blueridge and I’m not. I had so much fun last year. Julie Lessman you’re an awesome writer. Great books woman! Take care! And I’m so glad that even though Julie is SUPER -busy, she’s graced us with her usual effervescence. I took a class by Ramona Richards that was GREAT!!! So hands-on. Being a teacher, I love sitting under the teaching of others (especially good teachers). Some day I’d LOVE to give back to the conferences by lecturing. I truly enjoy speaking in front of people about things that impassion me. JILL!!! GIRLFRIEND, YOU KNOW I FEEL EXACTLY THE SAME WAY ABOUT YOU OR I WOULDN’T HAVE ENDORSED YOUR WONDERFUL BOOK. AND THANKS FOR COMING BY BECAUSE YOU REMINDED ME TO POST REVIEWS FOR YOU ON AMAZON.COM AND CBD.COM, WHICH I HAVE. YOU GO, GIRL!! How fun! CBD.Com and Amazon?! Love you Julie. Are you going to ACFW this year? This is probably my favorite of The Daughters of Boston series. (I read it all in one day.) It kept me on the edge of my seat and several times I caught myself lecturing the characters. Out loud. 🙂 The last 100 pages I was so worried I actually started biting my hand. And Lizzie is definitely my favorite charater because I can really relate to her. I liked Lizzie’s persistence in this book. She almost made a terrible mistake with John’s brother but fortunately she woke up in time. I did like John Brady but his stubbornness about sent me over the edge! He knew he loved Lizzie but didn’t feel worthy of her and wouldn’t let her decide for herself. I liked the part where Lizzie finally went to him and made him realize what a mistake it would be not to marry her (I’m trying not to spoil this for anyone who may not have read A Passion Denied). If you haven’t read this series yet, you are really missing out on some great fiction! PAM … YOU’RE NOT THE FIRST PERSON TO MENTION THAT TO ME. APPARENTLY JOHN BRADY FRUSTRATED LOTS OF WOMEN, WHICH I GUESS IS A GOOD THING BECAUSE IF YOU GUYS WERE FRUSTRATED, THAT MEANT THAT I DROVE IT HOME HOW FRUSTRATED POOR LIZZIE HAD TO BE, RIGHT? 🙂 THANKS FOR YOUR KIND WORDS, SWEETIE. I have 5 books on my NEED to read list – and I WANT to go back and read this one again. I always read your books twice FIRST. Once really fast – to find out what happens, and then another time VERY slowly to let the beauty of the story SEEP into my soul. My hope is that some of your wonderful creativity will move into my mind. Sigh.